Roudy’s expression suggests a combination of determination and disbelief as he wheels through water that nearly crests the cushion of his bright blue manual chair. He is living in one of dozens of shelters after the hurricane that left South Texas devastated tore through his apartment in late August. Roudy is well-liked within the disability and area community for his kind heart, humble nature and ready smile. 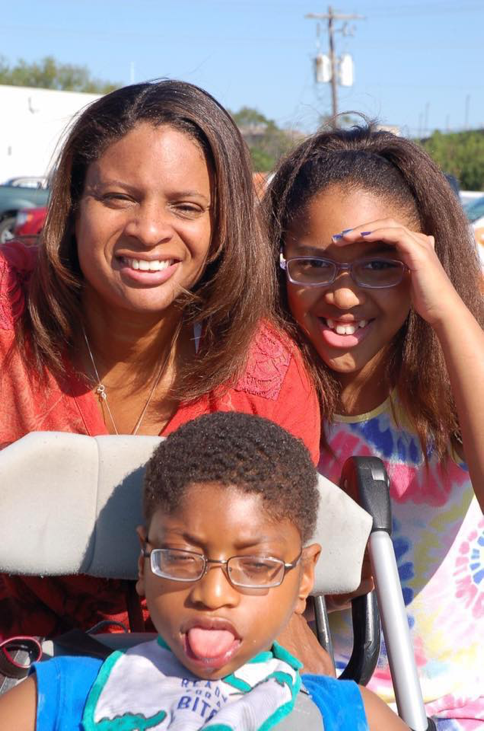 He’s a member of the area quad rugby team and excited to be taking on wheelchair tennis as his latest challenge. That was before Harvey left him homeless, struggling with infections of both feet from exposure to dirty storm water, and wondering how he’ll replace belongings that most of us take for granted like a refrigerator, clothing, bed…just essentials. With all that he’s lost he was hesitant to ask for help because he believed others who had lost more should be served before him. Even before the storm had completed its destruction, SPR executives were exploring how we could help. Several colleagues offered ideas, organizations, or relationships that might be worthy of our efforts. 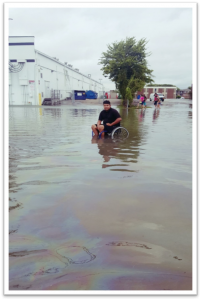 Following some fact checking, communication with relief efforts in the area, and related research we landed on an opportunity to partner with the Houston Chapter of United Spinal Association and its Executive Director Rafferty Laredo. Rafferty and Pat Maher, SPR Director of Civic Engagement, both serve on the Board of Directors for United Spinal, the largest non-profit organization in the U.S. serving people with spinal cord injury and other mobility disabilities. Rafferty has taken a leadership role in providing a wide range of aid to PwD impacted by the hurricane. He has become a de facto civilian ground general in this complex and critical effort to triage services and support to some of South Texas’s most vulnerable citizens. Working with Maria Town, Houston’s Director of the Office for People with Disabilities and former Sr. Associate Director of the White House Office of Public Engagement, he has corralled the resources of other non-profit agencies, volunteers and private sector corporations to bring relief and some sense of order to the chaos left in the wake of the storm. Since Harvey hit the area Rafferty has been working 16-hour days. 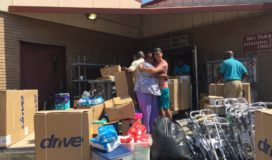 He’s unloaded tractor trailers full of wheelchairs, walkers and medical supplies, organized volunteer staff at makeshift distribution centers, delivered critical medical supplies to seniors, convened with advocates, politicians and devastated citizens, and given and received too many hugs to count. He’s been humbled by the support and response of the community. SPR is leading an effort to raise $25,000 for direct support. 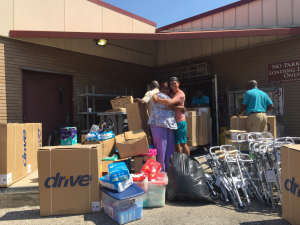 Along with one of our civic partners, Year Up Chicago, we are committed to supporting Rafferty and United Spinal Houston to bring direct aid to any citizens with disabilities who have been impacted by the storm. We are approaching $5,000 to date, and with your help we will reach our goal! CEO Rob Figliulo, on behalf of SPR Consulting, has offered to double match all donations until we reach the $25,000 goal. This generous offer will get us to our goal that much faster, but we need your help sharing the message.